The annual Brett Whiteley Travelling Art Scholarship has assisted the careers of some of Australia’s most celebrated artists. 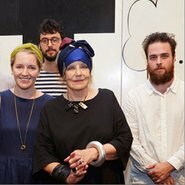 The studio will play host to the young members and previous recipients of the scholarship, James Drinkwater, Mitch Cairns and Lucy O’Doherty as we celebrate 20 years since the scholarship was awarded. Artists will share with us the impact this prestigious art award has had on their artistic careers.